This is Part I of a two parts tutorial covering the integration of Beebotte with Sigfox IoT network. 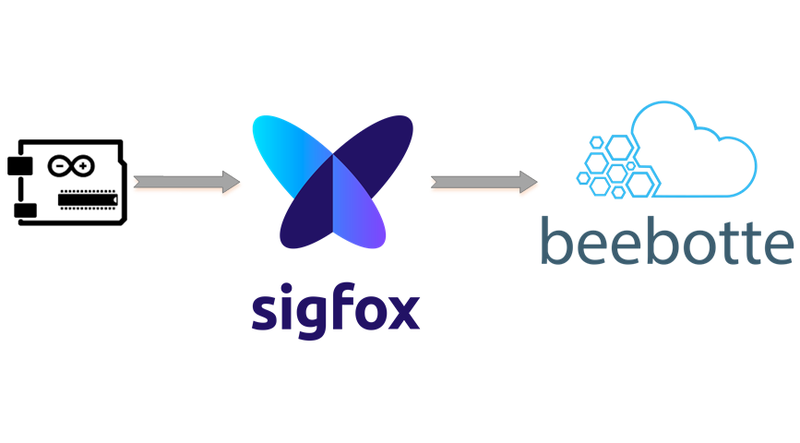 In this tutorial, we will show how Beebotte can be connected to Sigfox platform to collect sensor data and present it in a visual dashboard. In Part II, we will show how to use Spot'it, Sigfox's Geolocation service, to track the location of a device with Beebotte. This tutorial assumes that you have successfully registered to Beebotte and obtained your API and Secret keys. We will use an Arduino MKRFOX1200, a powerful board with Sigfox connectivity. We will use a DHT11 humidity and temperature sensor to periodically send sensor data to Sigfox. We assume here that you already associated your Sigfox capable device to Sigfox network. In order to receive data from Sigfox, we need to create a Channel with two resources for humidity and temperature. In your account home page, click on Create New and follow the instructions to create your channel. Now your Beebotte account is ready to receive data. Copy the channel token, we will use it when configuring Sigfox to forward data to this channel. Now let's move to Sigfox backend. 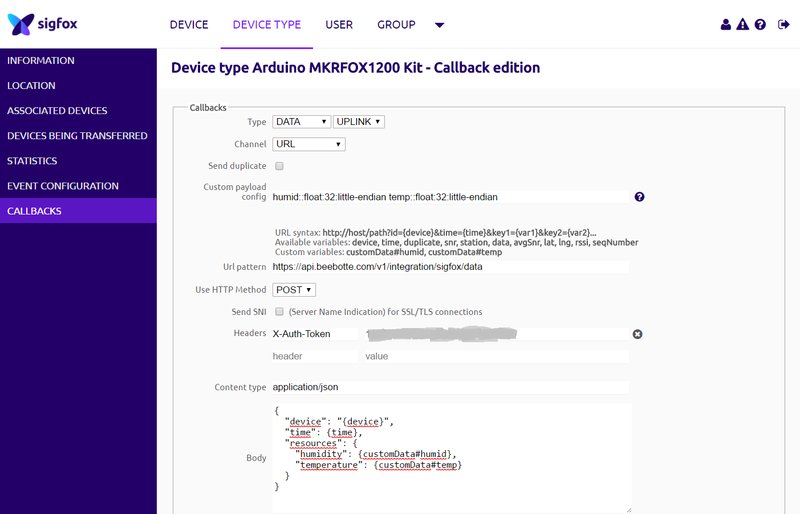 Custom payload config: this option tells Sigfox how to parse the data it receives from the device. We will be sending two float values for humudity and temperature reading. Keep in ming that Sigfox message is a byte array of up to 12 bytes. This custom configuration is a simple way to transform the message into corresponding values. Body: Set to the JSON object below. See how we are using the variables defined in the custom payload to construct the message. Keys in resources must match those of the corresponding Beebotte channel. Congratulations!!! Your Sigfox account is now connected to Beebotte. When your device sends a message on Sigfox network, you will receive it on your Beebotte Channel. Lets create a dashboard now to visualize received data. In your account page, goto My Dashboards and click Create Dashboard; enter a friendly name and a short description of your dashboard then add 2 Attribute Widgets and 1 Multiline widgets. For every widget, indicate the channels and resources where data will be read from. Voilà. In this tutorial we learned how to connect Beebotte to Sigfox network backend. We configured a data callback to forward messages received on Sigfox network to Beebotte channels. We then created a dashboard to visualize collected data in different graphical widgets. In Part II, we will use Sigfox Geolocation service to track the location of the device. © 2012-2018 Beebotte Corporation. All Rights Reserved.